Une distinction toute particulière de la revue le Cirque dans l’Univers pour Alexander I. Grimaïlo qui récompense son travail scénographique et sa direction d’artistes depuis plusieurs années. 1973-1977 – Circus High School. In 1977-1984 – artist-clown. Prizewinner of the All-Soviet Competition of Circus Artistes in 1982. Award of « Ural Jewel » won in 1982. In 1980-81 – prizewinner of the competition of Tula « Levsha » – the Golden Medal for the clown performance as clown; in 1982-1983 – the Golden Medal Tula « Levsha » as director. In 1980-1984, A.Grimailo as director (in cooperation with director A.Kalmykov) created the following shows: « All as in a Fairy-Tale », « Birth, Life and Death of a Clown », « 20 Years After », « Levsha », « Faust », « Land of Grustilia (‘sadness’) ». In 1984-1990 – Chief Director of Tula State Circus. Over 20 circus shows were created, including: « Laughter, Joy and Delight », « Three Musketeers », « Danko », « 12 Months », « Doll of Tutti’s Heir » (in Olimpiysky), « Farewell Circus Tour », « Disco-Circus or Laughing Aerobics », « Long-awaited Opening » and others. He worked in drama theatre of the city of Tula, in doll theatre and the cinema. In 1976 – stunts and effects director of the TV movie « Gentlemen Without Luck » (on O’Henry’s works) in Ostankino TV studio. In 1988-1989 – worked in film studio « Uzbekfilm » (city of Tashkent) as the director of stunts and special scenes in 4 part picture « White Fluff of Poplars ». During that time, over 30 circus acts and attractions, including: horse attraction « Russia of Heroes » under the guidance of V.Serzh-Aleksandrov, « Park of Masquerades » – little men circus in cooperation with A.Kalmykov; circus acts: « Space Fantasy » by the Borros, clown performances of N.Yashukov, V.Doveiko Jr., I.Rabei, P.Boyarinov, clown troupe for « Park of Masquerades » and others. « Klishing » by A.Riis Jr. ((the silver winner of children’s festival in Monte Carlo) and others. In 1991-1993 – Director of 6 circus programs of the Soviet/Russian circus in Japan. One of the organizers of the joint USA, Russian and Japanese project « Super Illusion » (1992-1993). « Gemini » (German wheels) – by S.Sannikov and V.Gunkin – Prize of the First Festival of Circus Arts in Moscow. 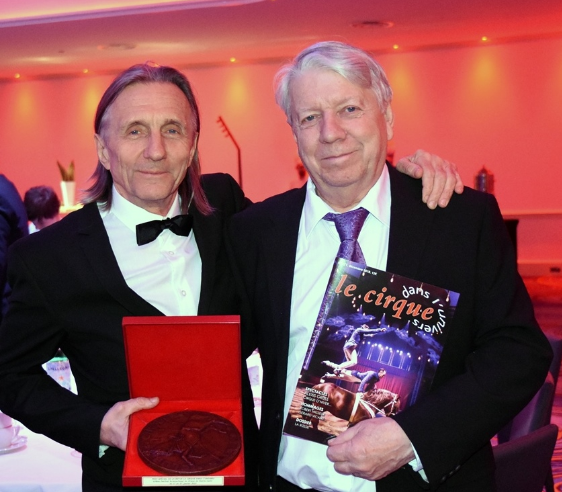 « New Russians » (teeter-board acrobats) under the guidance of A.Zakharov – Golden Bear at the First Festival of Circus Arts in Moscow, Prize of Jury at Monte-Carlo Festivals, Silver Clown at the International Circus Festival in Poland. In 1996, A.Grimailo was Chief Director of the First Festival of Circus Arts in Moscow in the Red Square and received the Special Prize for Direction. In 1997, A.Grimailo was awarded a title of Honoured Master of Arts of Russia. In the present time, A.Grimalo is working on two big avant-garde circus shows: « Geometric Figures, Space and Human Body » and « Signs of Zodiac ». New acts were created for these shows. Eccentric Clowns V.Makovsky & A.Penkov. The philosophical approach opens new perspectives in the development of circus arts. In 1995-1997, A.Grimailo was the author and director of the International Christmas Festival in Freiburg, Germany; President of the joint venture « Circus from Russia », Freiburg. Since 1996, A.Grimailo has taken part in international creative projects in Germany, UAE, the U.K., the U.S.A., Netherlands, Belgium. In 1998-1999 – he took part in the creation and development of the show « Eclipse » in Blackpool (UK). In 1999-2001 – creation of the circus programs for Butlins Family Entertainment Centres. In 2001 – A.Grimailo and I.Filippova have created and staged the show « Trance 2001 ». The show started on 2nd May 2001.- ponies and dogs « Mr. Dalmatine »- S.Prostetsov. In 2002 – the judge of the international circus festival » Gold circus festival » (Rome). Participation in opening circus school in Nairobi (Kenya) and carrying out the master classes. Participation in the European Youth Circus Festival in Wiesbaden (Germany): D.Prudnikov – equilibre, won a gold medal; M.Andreeva – flying rope, won a bronze medal. In 2002-2003 – participation in the International Christmas Circus festival in Freiburg (Germany): gymnasts on horizontal bar under guidance of S.Rokashkov. In 2003 – participation in XXIV International festival of tomorrow’s circus in Paris – XXIV Festival Mondial Du Cirque De Demain (France): gymnasts on horizontal bars under the guidance of S.Rokashkov, won the Gold medal. Creation of the African shows – programs from Kenya for performances in « Butlins » (Great Britain) from May till November. In 2003 A.Grimailo – the main director of the International circus festival in Saratov (Russia) on which have been submitted 60 acts and more than 200 artists . Participation in staging of circus show at opening ceremony of an exhibition « Expo » in South Korea in August, 2003. Participation in the International circus festival in Latina (Italy): D.Prudnikov – equilibre, won a silver medal. Participation in the China Wuqiao International Circus Festival: M.Andreeva – flying rope, won the silver award. Participation in the International circus festival in Budapest (Hungary): D.Prudnikov – equilibre, won the silver award. In the beginning of 2004 A.Grimailo has issued new eccentric act « The Man and the tube » – A.Romanovsky. In March, 2004 work on creation of original flying act « Dragonfly » under the guidance of N.Dobrovitsky was completed. This act participated in X International Christmas Circus in Freiburg (Germany) (2004-2005). Work on creation of new African shows – programs from Kenya for performances in the Great Britain is conducted. Also development of the new version of « Trance » for the European tour of 2004-2005 years is carried out. Alexander Grimailo in the co-authorship with known artist M.Chemiakin conducts preparation for creation of vanguard show « Metaphysic, the Geometrical circus « . This project assumes use of painting and scenography of M.Chemiakin in a combination to A.Grimailo’s vanguard circus acts. In 2004 A.Grimailo has occupied the post of the art director of the Center of a circus art in Moscow, being the base of Russia on creation of new products not only for circus, but also show business. From this time cooperation with « Circus Tihany » (Mexico) begins. Here rehearsals is passing and new acts are issuing, such as X-M.Rodriguez « Equilibre on persh « Guitar » (2005). 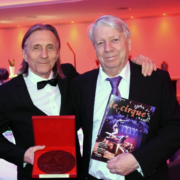 C.Demers, J.Gasser, Y.Kreer « Russian bar « White Crow » – a gold medal at XXVII Festival Mondial Du Cirque De Demain. At the present time work on preparation of new act has carrying out on the basis of this circus, and also at Nikulin Circus on Tsvetnoy Boulevard. A.Grimailo heads its creative group, which includes choreographer, artists, designers, trainers, composers, musicians. He works with young performers, trains the actors who can equally perform both on circus arena and theatre stage.